Throughout my time spent in the R/C hobby, I’ve come to appreciate certain avenues that I never thought I would. The funny thing about it has been how my appreciation has evolved into an obsession. 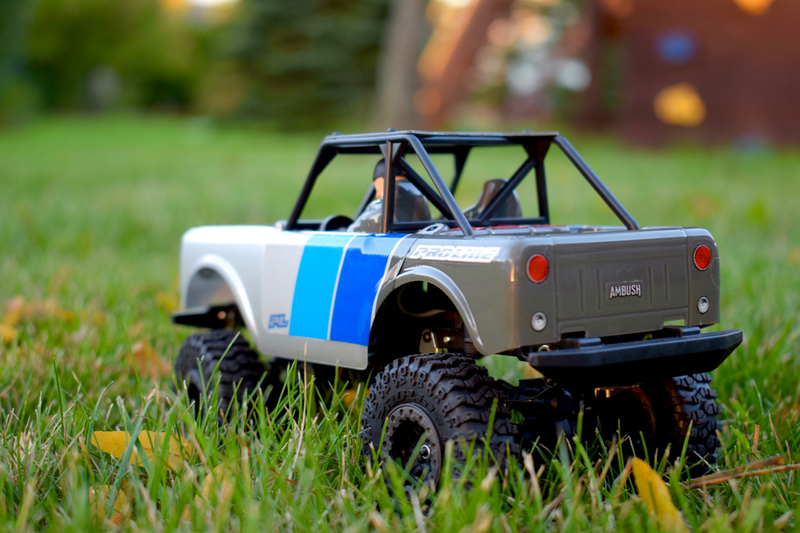 If you were to ask me what “sides” of the hobby I enjoy the most, my split-second response would be “scale radio-controlled vehicles/trail rigs” and “smaller-scale, mini/micro R/C machines”. When a radio-controlled car or truck manages to combine those two aspects, my attention is piqued. Pro-Line had my full attention when they announced their 1/25-scale Ambush 4×4 Mini Scale Crawler a few months ago. 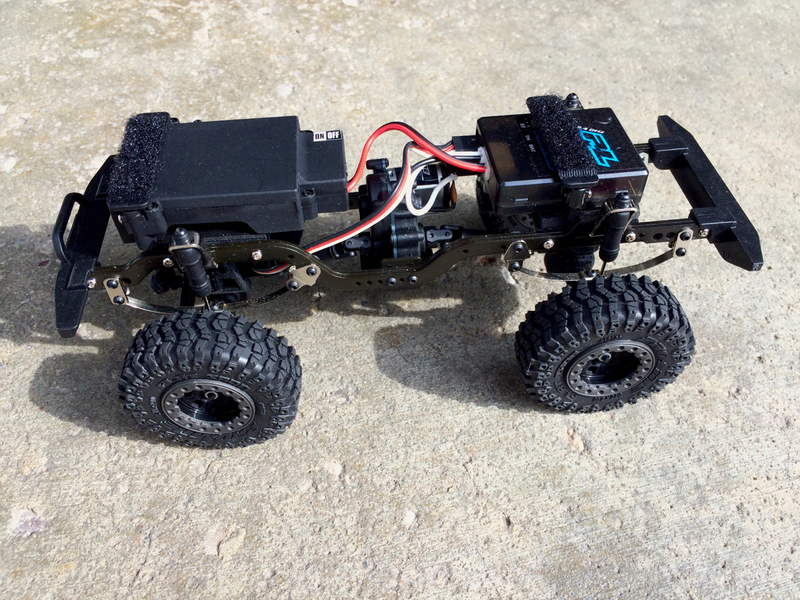 On the outside, it appeared to be the perfect combination of scale visual elements, scale chassis components, and a compact radio-controlled crawler. Thankfully, I was able to get a first-hand look at this ready-to-run (RTR) micro-model, courtesy of Pro-Line. Over the last few weeks, I’ve been testing, examining, and flat-out enjoying this model. Through it alI, I have discovered where it excels, in what areas it falls short, and above-all, how much fun it brings to the table. Starting at the bottom and working our way up, the design of the Ambush 4×4 chassis uses the same ladder frame setup that you’ll find on many 1/10 scale trail rigs. That provides the base for the scale aspects that this micro trail rig aims to deliver. Mounted onto the frame, from front-to-rear, you’ll find the battery tray/compartment, motor, and combined electronic speed control (ESC) and receiver. The receiver and transmitter are both capable of three channels, with the third channel port left open and available by default. Should you want to add lights or a micro winch to this rig, you’re given an opportunity to do so. Capping off each end of the chassis are scale bumpers, complete with LED mounting holes and a winch slot, perfect matches for that third receiver channel. The scale “feel” of the chassis doesn’t stop there. Four internal-spring shocks, paired with four leaf-springs, provide the suspension and dampening for this small crawler. The use of leaf-springs truly caps off the visual appearance of this machine. When the rubber meets the road, the Ambush 4×4 rolls on scaled-down Pro-Line Flat Iron tires that are mounted on Pro-Line Denali wheels. The look of the tires and wheels is the perfect compliment to the rest of this rig’s appearance. But these tires don’t just rely on their looks. They’re built to perform, and they perform very well. And that’s just what lurks underneath the polycarbonate body. Speaking of which, the lid for this 1/25-scale trail machine is one that has a rich history. Even though the Ambush 4×4 is a new model, its namesake has been out on the trail for quite some time. 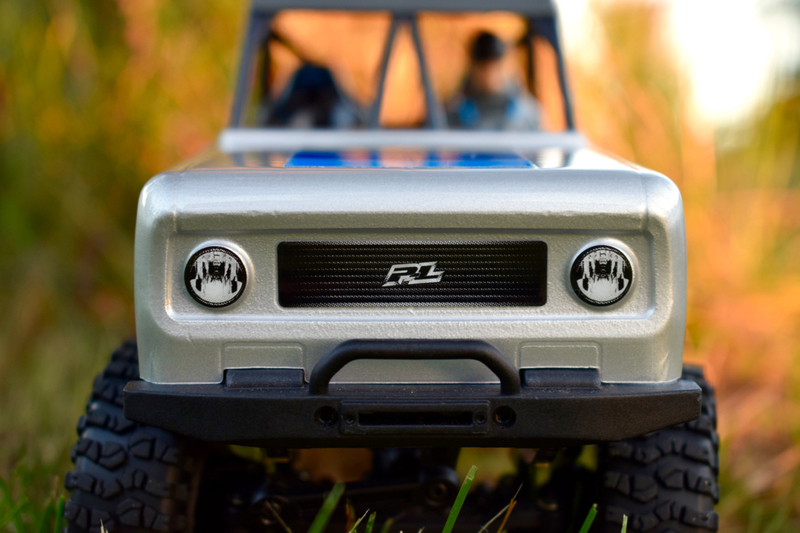 The original Pro-Line Ambush nameplate was first attached to a 1/10-scale rock crawling body and mimicked the body styling of the International Scout and Ford Broncos of the 1970’s. Between the scale chassis components and the body style of the Ambush 4×4, I was hooked from the moment I first saw it. I’ve had a longstanding appreciation and love for the International Scout and having the opportunity to own one, in any scale, has been an automotive dream of mine. The body alone is beautiful, but the additional details, including the open-air design, roll cage, and headlight/grille indentations, really provide a “wow” factor that makes this tiny truck stand out. But a closer look at the body reveals one major missing item. Body post holes. There are none, and this is a welcome and glorious omission. The small size and light weight of this body allow it to be secured onto the chassis with Velcro. The adhesion of these strips is good enough to keep the body intact while on the trail, but you need to be careful if you pick the rig up by its outer shell. At the time it was announced, I spent a good amount of time reviewing the details and description of the Ambush 4×4. While the scale details and compact chassis components grabbed my attention, the battery and battery tray were items that also struck me as being unique. The battery, a 350mAH Lithium Ion pack, is a custom fit to this micro scaler. Enclosed inside of a hard case, the battery lacks a “loose” connection cable and instead uses a male connector that “snaps” into the battery tray of the rig. This design keeps the internal clutter to a minimum, but that clean look comes with a small price. However, the use of a proprietary battery pack and connector means you can’t buy an aftermarket battery from your local hobby shop, install it, and hit the trail. I’m hopeful that Pro-Line will build on the popularity of this model and introduce longer run-time batteries and other accessories. Speaking of running time, I’ve managed to wring out an impressive amount of short, 3-5 minute runs on a single charge of the stock pack. When the battery does need to be recharged, an included USB charger gets the job done quickly. Featuring a LED indicator (two-red/two-green) to communicate the charging status, you can quickly glance at the charging cable to see how your recharge session is coming along. I’d argue that the controller is one of the more-important components of any radio-controlled vehicle, whether it be kit or RTR. Through the years, I have encountered a large number of controllers, each with their own quirks and intricacies. In some cases, smaller-scale models carry that petite size over to their controllers. 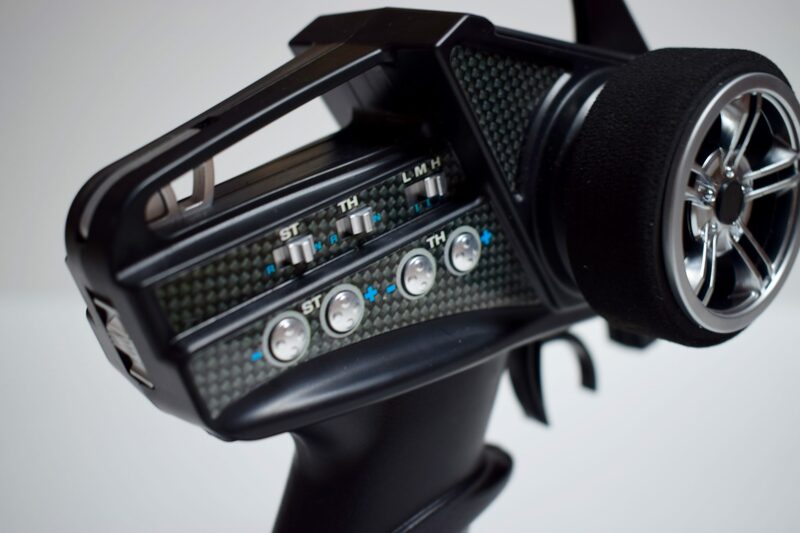 With the Pro-Line Ambush transmitter, you’re getting something in-between. While the physical size of the controller doesn’t quite match up with other 1/10 models, it isn’t “small” and doesn’t feel cramped. The primary controls are both easy to reach and easy to distinguish should you need to make adjustments on the run. Along with on-controller settings for throttle/steering trim, throttle/steering direction, third-channel activity, and dual-rate adjustments, a sliding, on-the-fly speed selector will help you conquer whatever obstacles lay before you. This specific feature came in handy, more than once, as I needed a little help navigating a trail obstacles and indoor barriers. The low and mid-range settings work quite well when you need greater throttle control and finesse to get yourself out of a situation. It should be noted that this setting affects the flow of power to the motor and doesn’t act as a transmission/gearing change. Battery strength also plays a large part in how effective the low-speed option is. When my battery charge was at half-strength, the Ambush 4×4 had trouble getting free of binding situations and powering over blockages. As for comfort, the controller feels great when you’re holding it and the steering wheel provides ample grip while maneuvering the Ambush 4×4. Your hands won’t feel fatigued after a day on the trail and you’ll find it hard to put the radio down once you get rolling. I will point out that the throttle response, when transitioning from forward to backward (and back again), seemed a little sluggish. I did adjust the throttle trim on more than one occasion and was able to dial the settings in, but some lag still existed. The scale of this rig just begs to be used indoors. Offices, warehouses, basements, you name the place, and the Ambush 4×4 is ready to rock. For my indoor testing, my basement turned out to be a prime location. Much to my chagrin, my kids have trouble picking up their toys after they’re done playing. While this typically isn’t something I’m happy about, it proved to be the perfect proving ground for my review. Zigging and zagging around and over a wasteland of toys, the Ambush motored through it all, rarely needing “hand-of-God” assistance. 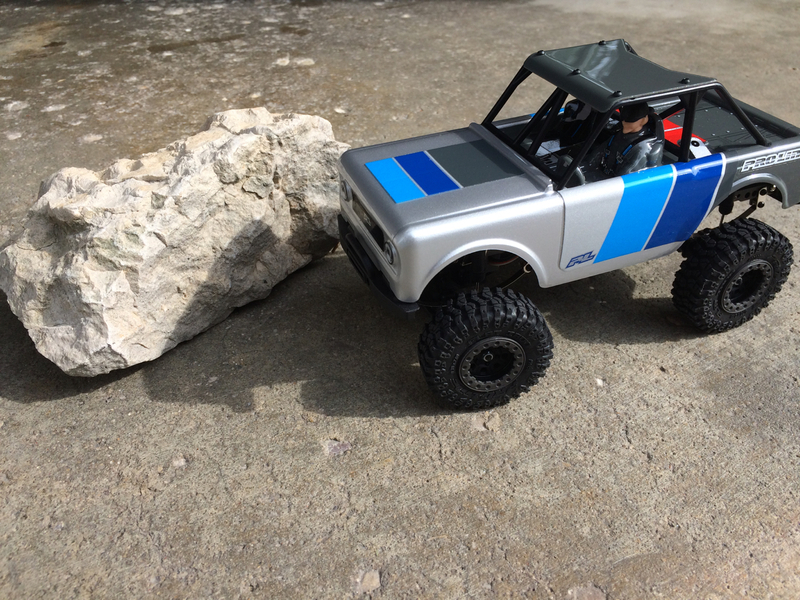 Its 1/25 size did prevent it from driving over obstacles that my 1/10 rigs can clear with ease, however I came away from my indoor tests very impressed with the performance of this machine. Tackling inclines is one test that I perform on all of my crawling and trail rigs. I did have some questions and doubts about how the Ambush 4×4 would handle these procedures, given the small motor and scaled-down stature of the tires. Thankfully, there wasn’t much to worry about once I got rolling. The grip offered by the smaller-scale Flat Iron rubber is second to none. Steep inclines proved to be no match for this tiny truck. It made quick work of whatever incline I put in front of it and gave the speed selection a workout. No matter what speed setting I chose, the Ambush 4×4 made its way up and down the path without breaking a sweat. Changing up my indoor tests, I wanted to see how the leaf-spring suspension handled “drastic” elevation and obstacles at the same time. This is where the Ambush’s size and suspension components created difficulty when driving. The narrow width of this rig makes it easy to roll when one side is higher in the air than the other. Aiding this action is the lower amount of travel in the suspension. While I was hoping the Ambush 4×4 would would have all of the traits and driving characteristics of a 1/10 trail rig, that just isn’t the case. There are many moments where you’ll have three tires making contact with terrain and obstacles, while the fourth is lifted into the air. In the end, there isn’t much flex from the suspension or the chassis, when traversing intense obstacles. Having said that, almost every obstacle (save for one that required modification to better-suit a 1/25 vehicle) that was put in front of the Ambush, it conquered without much trouble. The previously-mentioned stiffness and low suspension travel made for some difficult driving at times, but I was forced to change my approach, adjust my line, and think my way out of “stickier” situations. And I had a blast while doing it. Given the size of this small-scale truck, it’s easy to think that it would perform at its best while indoors. After my indoor test revealed some handling quirks, I wanted to see how the Ambush took to the great outdoors. For my first test, I brought the Ambush with me during my lunchtime break and visited a local park and hiking path. The path was on the “easy” side with parts of it being paved while the remainder of it was covered in mulch. It featured a beautiful forest backdrop and on each side of the path were sticks, twigs, and small gullies that were the perfect compliment to the vehicle I was carrying. Starting out on the paved path and quickly transitioning to the much-covered area, the Ambush 4×4 performed like a champ. The path was relatively clear of natural debris and I was able to drive anywhere I pleased without having to push the vehicle’s capabilities. After a few minutes of this, I ventured off the beaten path and onto the shoulder of the walkway. Here, I encountered larger sticks and logs, some of which were much larger than this tiny trail rider. Using the handy speed setting adjustments on the transmitter, I had no trouble navigating these natural obstacles, making quick work of barriers and steep inclines. From the performance and handling side, the Ambush did everything that I asked of it. And on the visual front, it looked the part of a trail truck as it made it’s way down the path. A few weeks later, I brought the Ambush 4×4 along for a family hike in a state park here in Wisconsin. Filled with elevation changes, differing terrain types, and pathways that featured roots and rocks, this was the perfect outdoor test of this tiny rig. The surroundings of this trail test were extreme, especially by 1/25-scale standards. There were a few flips, tumbles, and falls, but again, the level of fun never diminished. 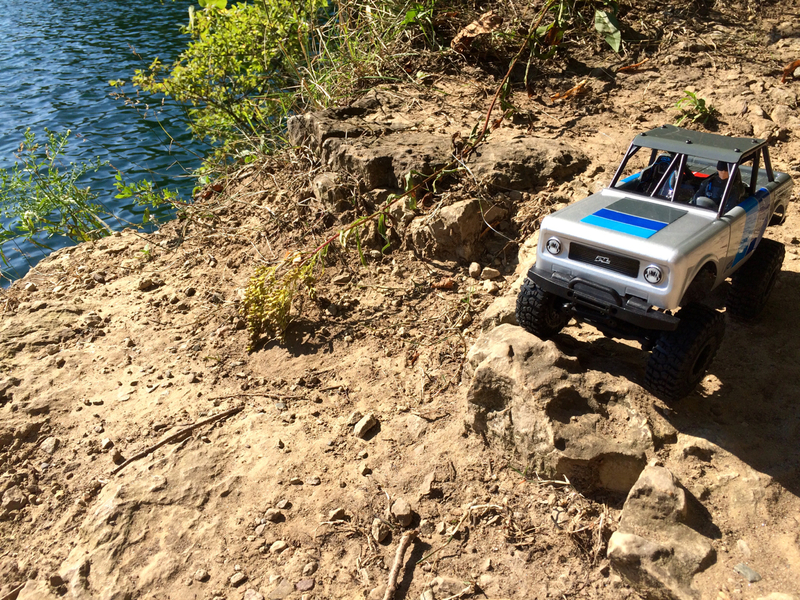 Overall, the Ambush 4×4 did everything I asked of it, and then some. While the extreme nature of the obstacles proved to be too taxing (at times), the for the narrow width and previously-mentioned suspension/chassis challenges, it remained a blast to drive. 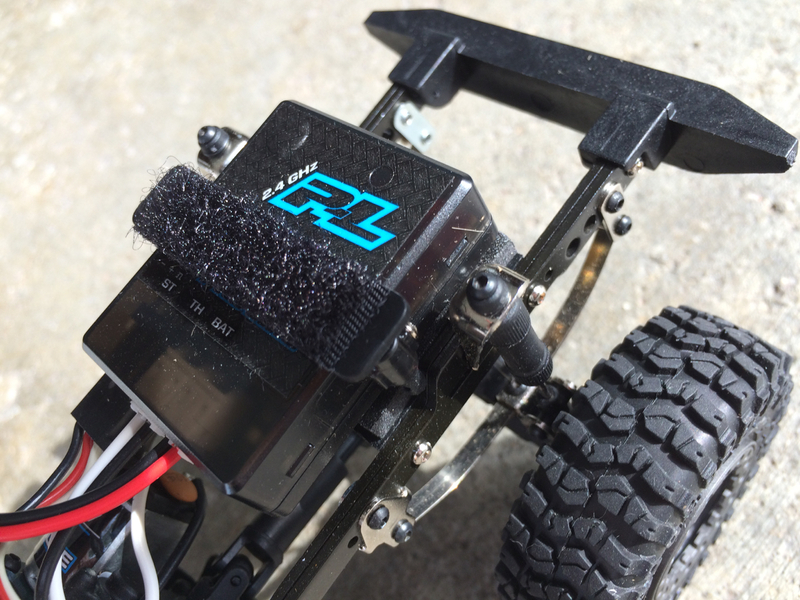 Is the Pro-Line Ambush 4×4 the Right R/C for You? After weeks of indoor and outdoor test, my overall enthusiasm for this small-scale rig hasn’t waned. Small-scale R/C vehicles have become my “go-to” when I want to unwind for a few minutes and forget about my day. No matter the scale, these vehicles all have the same effect; they bring the fun. Pro-Line’s Ambush 4×4 also fits into this “fun” category, but offers some additional perks. The slower speed makes it a natural fit for indoor driving and the compact size enables you to take it anywhere and drive it. It’s the perfect messenger bag companion for a lunchtime drive around the office or stopping by a park on your way home from work. No matter what the situation, you can find time to drive this vehicle. The question you have to ask yourself is this; “Does Pro-Line’s Ambush 4×4 have a spot in my R/C collection?”. The two largest factors in that decision may be performance and price. Let’s tackle performance first. From all of my testing and evaluation, the Ambush 4×4 doesn’t behave exactly as a 1/10-scale trail rig would. The narrow width and suspension setup don’t allow for much flex out of the box. 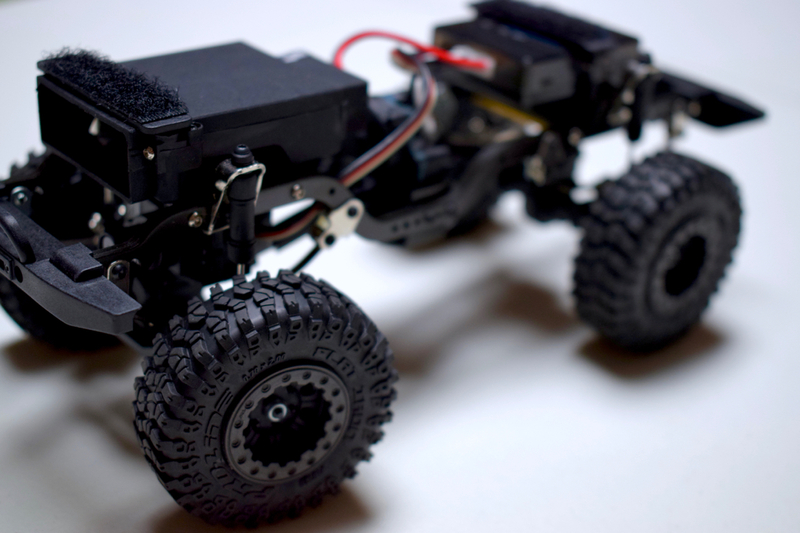 You could do a few modifications to it, such as removing the internal shock springs, and to get closer to a larger-scale crawling rig, but you’re not going to see a mirror image, handling-wise. As for price, the near-$200 price tag ($195.46) may cause you to think twice about this purchase. I have paid far more and far less for a variety of vehicles with multiple levels of build quality. In my mind, Pro-Line hits a home run with the quality and build craftsmanship of this rig. I didn’t see any craftsmanship issues or defects that caused issues during my testing, and I don’t foresee any cropping up down the road. As hobbyists are quick to say, “you get what you pay for”. With the Ambush 4×4, you’re investing in a premium-level, small-scale trail and crawling rig that you can take, and drive, just about anywhere you could imagine. It blows away boredom with the flip of a switch and brings smiles to the faces of those driving, and watching it. You can’t put a price tag on fun, and the Ambush 4×4 brings the fun in spades. Save 10% when you buy the Pro-Line Ambush 4×4 at prolineracing.com. Use coupon code “RCNEWB10” to activate your savings!